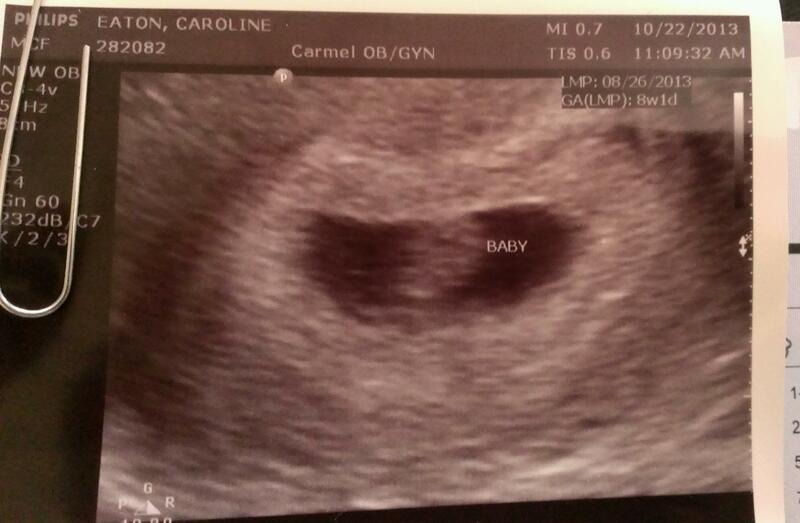 First Pregnancy: 8 Weeks, We Finally Got To Meet You! This is the week I have been waiting for. I already knew I was impatient, but this week felt like FOREVER away. I knew once I heard the heartbeat and the doc told me all is good with Baby E, a huge stress and nerve will be put to rest. I am still in the ‘I don’t feel pregnant’ stage so I leave Baby E’s photo on the fridge and stare at it.. reminding myself that it is a photo from inside me! Yes, I have small symptoms, but nothing that screams YOU’RE PREGNANT! So – this week was one of the biggest for me! Baby E’s heartbeat was 134 and everything ‘looked perfect’ according to the nurse. We spent three hours going through paperwork, educational what not to eat and what not to do when you’re pregnant and giving away most of my blood for tests. Overall I was so grateful Josh was alongside me at the appointment and I am already counting down until our 12 week appointment! With that great news I jumped on a Megabus to Nashville and went to visit my best friend Kendall who just moved down there. It wasn’t my first time in the music city, but it was my first time being there of age. I fell in love with the live music, outdoor seating and friendly attitude of everyone we met. We had so much fun exploring all day and into the night. It definitely reminded me I was pregnant since every day I had to convince my friend that nap time was a necessity, as we crashed on her couch around 3 pm every day resting up to enjoy the live music that night. I know they say keep it a secret until the risk of miscarriage goes down after the first trimester, but I have told a few of my close friends, and the morning of my appointment I got an overwhelming number of texts and encouragement. It feels awesome knowing that I have so many people praying for me and Baby E, it helps me put my mind at ease for anything that could go wrong. Best moment of the week: Hearing Baby E’s heartbeat at our first appointment! What I’m most looking forward to this week: Showing. I know this is probably one of those things I am lucky to NOT show, and with my 2nd pregnancy I’ll be wishing I wasn’t showing so early, But there is a part of me that can’t wait to have a pregnant belly and see what that feels like. What I miss the most: Killing myself in the weight room. I use to love getting really sweaty and totally exhausted in the gym. I’ve been taking it easy for awhile and now that I am actually pregnant I am taking it really easy! Even a few squats will quickly get me winded! Symptoms: Waking up in the middle of the night to pee. Food doesn’t have any taste. I don’t crave anything, and the food doesn’t make me nauseous, but nothing tastes good and I am never hungry.